Last week, Hollywood star Arnold Schwarzenegger was in town to launch the audio of director Shankar’s upcoming film I. This film has Vikram, Amy Jackson and Upen Patel in the central roles. 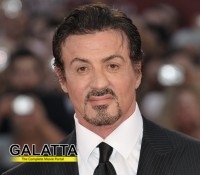 The latest update is that Hollywood sensation Sylvester Stallone might grace the audio launch of the Hindi version of I. However this has not been confirmed by the I team. Earlier, we heard that actor Jackie Chan would be the special guest of honour for the Telugu audio launch.